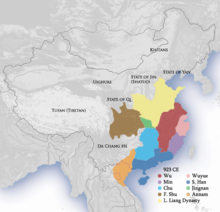 The Five Dynasties an Ten Kingdoms period, an aa cried Five Dynasties, wis an era o poleetical upheaval in 10t-century imperial Cheenae. During this period, five states quickly succeedit ane anither in the Cheenese Central Plain, while mair than a dozen concurrent states war established elsewhaur, mainly in sooth Cheenae. This page wis last eeditit on 15 August 2015, at 19:56.